Animal lovers from throughout North Hastings and beyond converged on Bancroft’s Millennium Park on the morning of Saturday, Aug. 11 for Home Again’s first ever PetFest. Aiming to generate funds to help cover the many costs that come with rescuing and caring for cats and dogs in North Hastings, Home Again’s director of cats Clarice Smith was thrilled to see so many people coming out early to be part of the inaugural festival. She said Home Again is currently caring for and finding forever homes for 47 cats and several dogs. She said the organization is always in need of donations, volunteers and people willing to foster an animal. “We are looking to raise money for the animals to support the work that we do to help them,” said Smith. To generate funds at PetFest supporters of Home Again held a community yard sale in the park, as well as a charity barbecue. The event also featured a variety of vendors, live music, and face painting for the kids. During PetFest, Home Again also launched its pet microchip program. Through this ongoing initiative, people can bring their cat or dog in to have a microchip placed in their companion animal’s ear. With the microchip, in the event a lost pet gets turned in, it can be scanned and returned to its owner. Smith said people can have their pet microchipped by contacting Home Again and making an appointment. “We find a lot of lost cats and dogs, so we really want people to come out and get their pet microchipped,” Smith said. 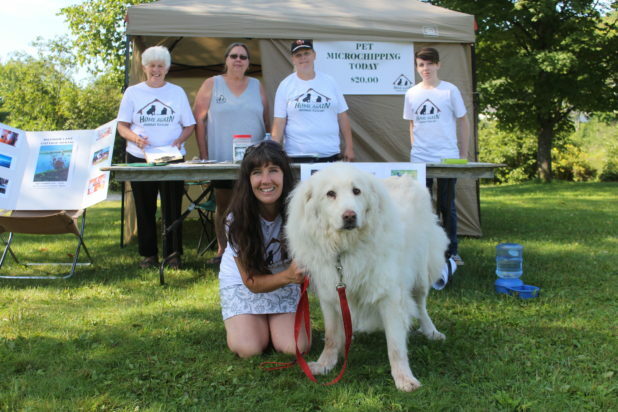 Andy Tamblyn was passing through Bancroft on his way to pick up some locally grown vegetables at the farmers’ market in Maynooth with his pooch Buddha when he saw the sign for PetFest by the road and decided check it out. Picking up a gently-used pet bed at the yard sale for his pal to enjoy at the cottage, he said he was happy that he stopped. “Communities need to have more events like this to help animals in need,” said Tamblyn. Pointing to his shirt which read, “Celebrate Earth Day Every Day” Tamblyn said he went vegetarian about 10 years ago to lessen his ecological footprint. At this time, he said he began to ask questions about where his food came from and how it was produced. Saddened and disturbed with what he learned about factory farming, Tamblyn said he decided to go vegan to help the environment and stop supporting animal cruelty. Expressing how much he adores his companion Buddha, he said that he would never eat another animal again. “Whether it’s a dog, cat, pig or a cow it doesn’t matter, every animal has a soul,” said Tamblyn. To learn more about Home Again’s new microchipping program, to donate, volunteer, adopt or foster an animal visit them online at: www.homeagainbancroft.ca; or contact 613-338-0037.